Most federal universities, including some state universities, still retain the policy of catchment area in selecting students for admission. For instance, UNILAG catchment area constitutes majorly South Western states. What this implies is; prospective students from the South West have higher chances of gaining admission. For example, a prospective student from Osun state who scored 56, applying to study sociology may be offered admission while another student from Imo state who scored 60 may not be offered admission. This is so because if the catchment cut-off point for Osun is 56 while the general cut-off is 62, such a student from Imo state has definitely lost the admission despite having a higher score than his counterpart from the catchment zone. In view of the above, admission seekers should always be aware of a university’s catchment area and requirements before selecting any university. Often times, I pity most Jambites who score within the range of 180 and 210 because such scores limit their chances of gaining admission in a situation where they have to compete for the same admission slot with students who score as high as 250 and above. And most universities still compute both UTTME and post-UTME scores in calculating the student’s average score. Hence, having a low UTME score can also hinder one’s opportunity of gaining admission. It is always advisable for students to try to score 250 and above in order to be on a safer side. 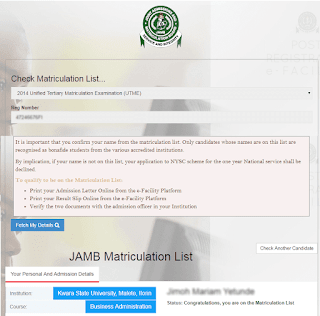 As a matter of fact, it is very necessary concerning the JAMB policy of redirecting students with lower UTME scores to less-competitive universities. I do advise admission seekers to pass ALL the necessary subjects in their O’level exam(s) very well before going ahead to take UTME exam. I have met with lots of students who lost their admission because they did not have at least credit pass in some important subjects in their O’level result. Recently, I met with a student who lost his admission to study medicine at Olabisi Onabanjo University, Ago-Iwoye (OOU) because he did not have at least a credit pass in Mathematics in his O’level result. In fact, I felt very sorry for him because gaining admission to study a competitive course such as medicine is not easy.